I covered this tip in video form last week, but I’ve decided that at least some of those features, including this one, should be covered in the standard Hints weblog as well—this way, you can still easily find them via searches, like with our search box, for instance. I’m also tossing in a bonus tip about advanced printer setup options, so even if you already watched the video, there’s at least one nugget of new information in today’s blog entry. One of the changes Apple made in OS X 10.5 is the way your printer icons are handled. After printing a document, the printer icon will remain in the dock until you quit it yourself. In OS X 10.4, the icon would vanish as soon as the print job completed. If you prefer the auto-vanish behavior from Tiger, the solution is simple, if not obvious. 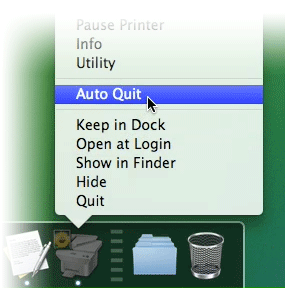 When the print job completes, control-click on the printer icon in the dock and choose Auto Quit from the pop-up menu, as seen in the image at right. From now on, the printer will vanish from the Dock after each print job. You’ll have to repeat this process for each printer you use, but only once per printer. As for that tip about advanced printer setup options…this is something else that Apple changed in OS X 10.5. If you’re connecting a non-standard printer, or a standard printer via a non-standard protocol (including some PCL-only Windows-shared printers), the Advanced setup screen is what you’ll typically use to make the connection. In OS X 10.4, you reached this screen by clicking the Add button in the Printer Setup Utility’s toolbar, then Option-clicking the More Printers button and selecting Advanced from the pop-up menu. Once activated, you could choose connections such as a FireWire printer, Bluetooth modem printer, or Fax Printer, among many others. In Leopard, this screen has seemingly vanished. In reality, it’s moved to somewhere more accessible, though it’s hidden by default. To reach the Advanced setup options screen in OS X 10.5, first click the plus sign in the Print & Fax System Preferences panel. When the next window appears, Control-Click in its toolbar and choose Customize Toolbar. When the customization sheet appears, drag Advanced into the toolbar, and you’re done. In comparing OS X 10.4 with 10.5, it seems the Advanced menu has lost many of the options it had before, but I’m no printer expert. Perhaps they’ve just been renamed and/or moved to other areas of the print dialog.